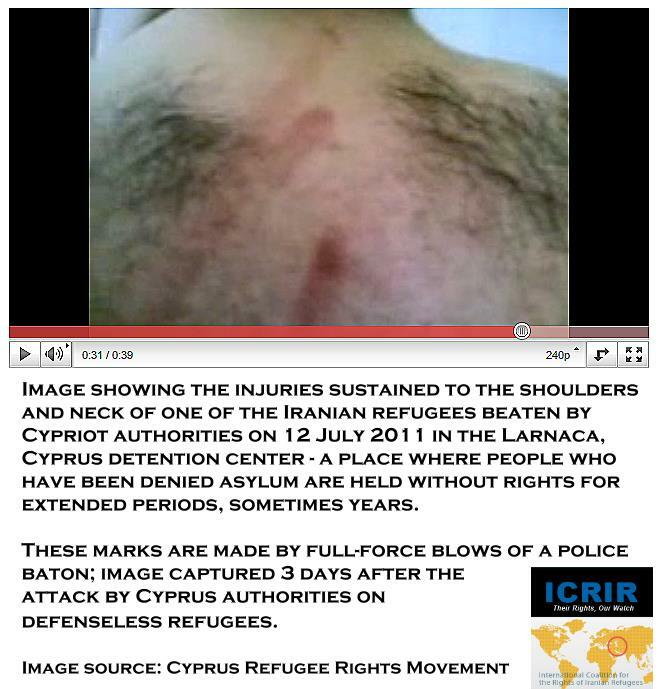 On Friday 22 July 2011, the International Coalition for the Rights of Iranian Refugees (ICRIR) received a report from the Cyprus Refugee Rights Movement (CRRM) that the Cypriot non-governmental organization KISA visited the Larnaca detention center where Iranian and other defenseless refugees had sustained a brutal attack by armed police on 12 July 2011. The visit by KISA was the first by any entity outside of the detention center since the attack had occurred 10 days previous, although the UNHCR, the EU, the International Committee of the Red Cross, KISA, the Ombudsman of Cyprus, and others had been informed within a few hours of the attack, and although one of the detained refugees had been reported as sustaining a broken leg. Although a number of both Iranian and non-Iranian asylum-seekers had signed a complaint about the attacks, the delegation from KISA is reported to have visited only two of the Iranian complainants: Mohammad Khosh Sorour, who has taken the lead in ensuring that information about the beatings reaches the outside world, and Mostafa Hajilou, whose leg was reported as broken. The holding of individual – rather than collective – interviews was protested by Khosh Sorour and Hajilou. As a result, they were promised that all detainees affected by the police attack would receive the same opportunity to interview; however, this has not yet been realized. Some of those beaten in the attacks have since been deported while others have been dispersed and their whereabouts remain undisclosed. The interviews were conducted in front of the officials of the detention facility, including the officer in charge; these two are in positions of primary responsibility for the attacks on 12 July 2011, which resulted in injury to both of the detainees. The officer in charge took notes during the exchange of questions and responses. It is reported that Mohammad Khosh Sorour asked why the officer was taking notes; the officer responded that it was for a report for more senior officials. We also learned from Mr. Khosh Sorour that after the interview with KISA in front of the prison staff, he was threatened for having told what had happened to him. The detained refugees at Larnaca requested that KISA convey a hand-written complaint to the CRRM. KISA faxed the complaint the same day. ICRIR on behalf of CRRM and all non-Iranian detainees is grateful for KISA’s kind assistance in this regard. After the visit, the detainees once again requested that Mr. Hajilou be allowed to go for medical treatment. The authorities finally relented and Mr. Hajilou was seen at the Larnaca “Old Hospital” where he received an x-ray; he was also prescribed medications which, it is reported, he does not now have access to. Because the complaint against the government of Cyprus is a legal procedure and will be seen through by all involved organizations, the diagnosis of Mr. Hajilou is a relevant document. Therefore, we are awaiting more details on Mr. Hajilou’s diagnosis, treatment, needed medications, and the reasons why he is not able to obtain those medications. (It should be noted that after the initial attacks, detainees’ medications were reported confiscated; this may or may not be the case in this instance as well). The translated, English-language text of the complaint appears below; the scan of the original letter in Farsi along with translation to English is embedded below that. English translation of the complaint submitted on 22 July 2011 by Iranian and other detained refugees in Larnaca, Cyprus detention center, regarding brutal Cypriot police attacks against detained refugees on 12 July 2011. We kindly inform you that on 12th July 2011, the police visited the detention and forcibly and by beatings removed one of the detainees who has been held for the past 12 months in relation to his visa [with the intention of deporting him]. The other detainees protested against this act by the police throughout the whole detention center. The reason [for the protest] was that the person was not warned about the deportation, and his case was not attended to. While beating on the others, the police continuously accused the detainees – Iranians and Arabs – for being involved in the explosion [editor’s note: this refers to the recent disastrous explosion of the Islamic Republic’s munitions on Cyprus]. They said, “Iranians and Arabs are not going to be helped in Cyprus. Either you leave our country or you will die in prison.” As a result of the beatings by the police, a number of asylum-seekers had injured hands and legs. They were not taken to hospital. Now, 10 days has passed that date, and Mr. B and his son and wife, who had spent 4 months in the detention center waiting for their visa, were forcibly deported. None of the injured has been taken to hospital. They have told us, “Nobody is going to be taken to hospital unless they are dying.” And the police have been ordered not to give anything in the way of amenities or communications devices to the detainees. We have been threatened that if we protest, we will be removed to detention centers with worse conditions. We have been threatened with having our files tampered with. We, the signatories of this letter, complain against this inhuman behavior of the police to the humanitarian organizations. We request that you provide oversight for our cases, and we inform you about the risks of us being dispersed to different facilities. We ask your honorable organizations to personally supervise our cases.